The human body stops producing elastin when your reach physical maturity. 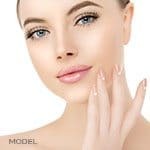 This is when the aging process begins, and collagen begins to lose its elasticity. But there is a procedure at MilfordMD that can help reverse, or freeze, this process – Venus Freeze. Venus Freeze is a procedure performed by Dr. Marina Buckley that tightens skin, reduces wrinkles and cellulite, and contours the body. It works by incorporating multi-polar radio frequency and magnetic pulsed fields into one device. The multi-polar radio frequency causes a thermal reaction in the tissue, which stimulates the body’s natural healing response. The restoring response causes new collagen to form and the production of new elastin fibers. This causes the skin to look and feel firmer and the skin appear more elastic. Body contouring is achieved when the temperature of the skin is elevated and the body releases stress hormones. The stress hormone attaches to specific receptors on the membrane of the fat cell in the hypodermis and activates the hormone sensitive lipase. Free fatty acids exit the fat through the blood stream, reducing the volume of the fat cell giving you a more contoured shape. Venus Freeze is suitable for both males and females of all skin types. If you want to improve the look and feel of resistant areas of the body, decrease wrinkles without needles or surgery, considered tightening skin and decreasing cellulite and are looking for a non-invasive procedure that is painless and delivers quick results, Venus Freeze may be what you are looking for. Review of medical history and aesthetic goals can help determine if Venus Freeze is right for you. How does VENUS FREEZE differ from other procedures? 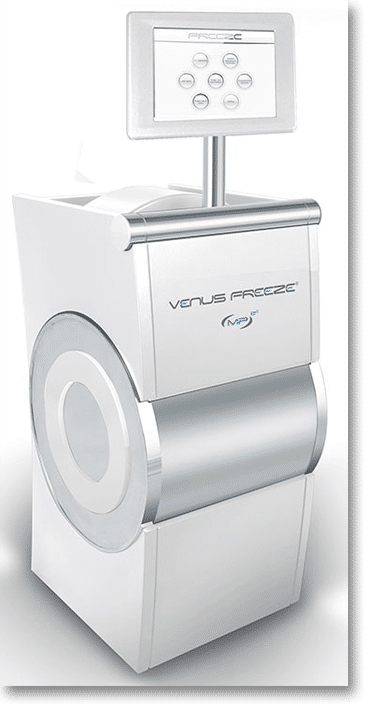 Venus Freeze offers quick results with no pain and no downtime. Venus Freeze is FDA approved for facial wrinkles and licensed by Health Canada for non-invasive treatment of temporary cellulite and temporary skin tightening. There have been numerous clinical trials by both physicians and medical researchers. It’s pain free, and there’s no downtime or harm to the skin. Venus Freeze feels similar to that of a massage. Patients lay on a treatment bed and a treatment gel is applied to the skin to help the application glide on the surface of the skin. The doctor applies smooth, consistent movements with the applicator on the surface of the skin. Patients describe it as a warm massage similar to a hot-stone massage. You can actually close your eyes and relax during the entire procedure. The procedure takes approximately 15 minutes for the face and 40 minutes for each body area, meaning you can come on your lunch hour. 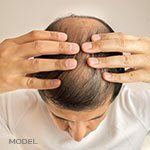 After the treatment, you’ll feel relaxed and the area of treatment may feel warm. There may be a slight pinkness to the skin that may last for no more than an hour. Most patients see results after the first treatment and others in as little as three treatments. A full series is advised for optimal, long-term results – six treatments for face and 8 to 10 for the body. It’s not uncommon to see improvements in the skin for up to three months after a series of treatments. After the series is completed, maintenance is recommended – typically one treatment per season, or four a year. To schedule a consultation with Dr. Marina Buckley, call MilfordMD at 570-296-4000.